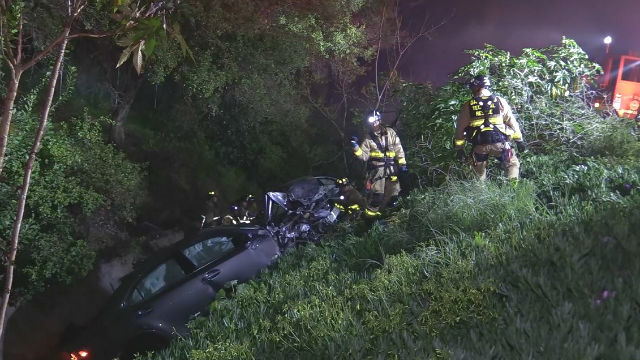 At least one person was killed and three were injured in a crash on state Route 163 in Balboa Park early Saturday morning. Two cars crashed just after 2:30 a.m. on southbound Route 163 just south of Quince Drive, according to the California Highway Patrol. Witnesses told the CHP both vehicles went off onto the right shoulder area and that one might have overturned. One of those cars, a Mazda sedan, was a ride-share vehicle carrying two passengers and the driver, CHP Sgt. Brent Lowry told NBC San Diego. The other car was a Lexus sedan, occupied only by its driver. Lowry told NBC San Diego one person was ejected from the Mazda, though he couldn’t say whether the person was the driver or a passenger, or if that person died. The three other people involved in the crash all suffered moderate to major injuries and had to be hospitalized, the news station reported. All southbound lanes were shut down in the immediate aftermath of the crash, according to the CHP. The No. 1 lane was opened at 3:01 a.m., and both lanes were open in the area by 7 a.m.